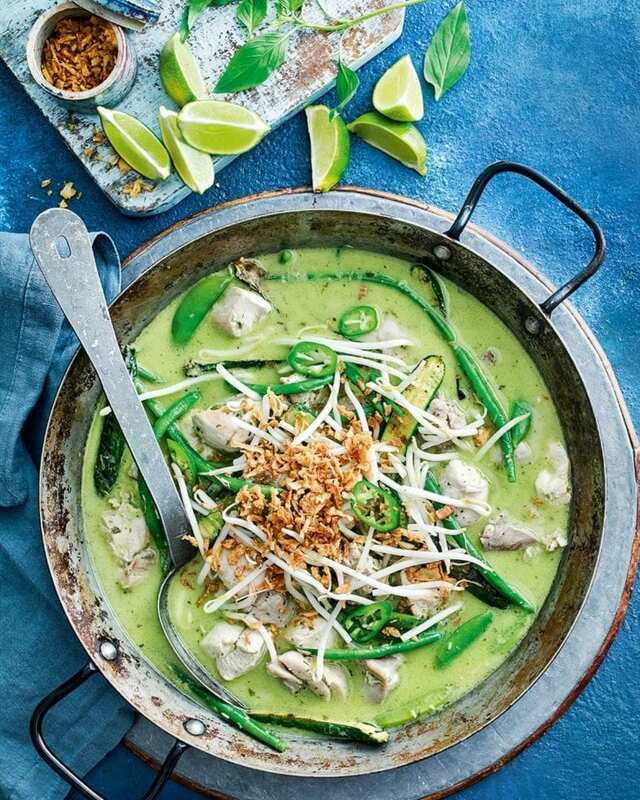 A classic Thai green curry, made properly, is a wonderful midweek meal that the whole family will love. Serve with steamed rice and fresh lime wedges for added zing. Whizz all the ingredients for the curry paste in a mini food processor or the small bowl of a food processor (or grind in a large pestle and mortar) until smooth. Heat a glug of oil in a large, deep heavy-based frying pan or wok, cook the courgettes until charred, then set aside. Add the chicken and cook over a medium-high heat for 6-7 minutes, stirring, until pale golden. Add the paste and cook for a few minutes more, stirring, until it smells aromatic. Stir in the coconut milk and bring to a fast simmer. Return the courgettes to the pan, add the sugar snap peas and green beans, then cook for 5-6 minutes or until the veg are just al dente. Scatter the curry with the beansprouts, crispy onions, sliced green chilli and Thai basil leaves, if using, then serve with steamed rice and lime wedges. Vary the curry paste to suit your taste, adding more chilli if you like more of a kick, or more garlic, ginger or lemongrass if you like more aromatic flavours. a little extra oil stirred in. New Zealand’s aromatic whites are wonderful here – sauvignon blanc or gewurztraminer.